I am here as a "friend" to the process at Jim Buckley's and Todd McClave's invitation. First, I may have something incorrect here but I see no conflict between high mass fireplace principles and a super-insulated fireplace. 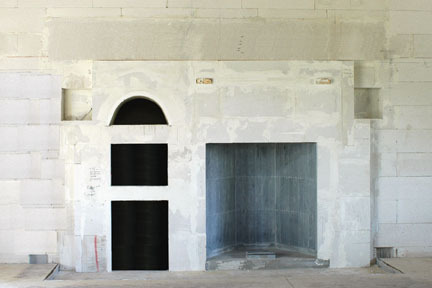 At my building science and idea lab, e-House (www.e-House.us), we built a Rumford 36" fireplace using a www.rumford.com kit and tweaking the design. 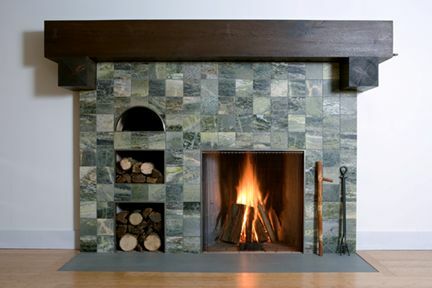 In essence I used Finnish soapstone from Tulikivi for the back hearth, giving the firebox a high thermal mass. 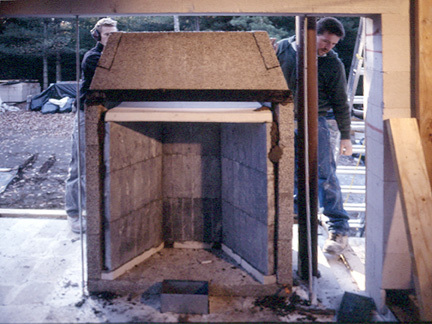 The back hearth was constructed of Isokern, then insulated it at the sides, back, and top with anywhere from 1- to 2-feet and more of aerated autoclaved concrete block (AAC) by Hebel. The chimney is similarly insulated all the way up. A small fire here will burn cleanly at 1200F to 1400 F and will keep the fireplace assembly warm for 16 to 24 hours after the fire goes out. I use twigs and other site-sourced kindling when available, supplementing it with birch bark. The bark has a pleasant odor when burned, acting as a sugary "aroma therapy" agent for the house. The oils in the bark pour heat into the kindling, acting as an accelerant in sheet form. Pine "starter sticks" do much the same but the odor is more pungent and the oils in the sticks seem to deliver a more concentrated and intense heat. When it is available I prefer the birch bark, especially from felled or standing dead and well-dried-out trees. 2) Cold air plugs in the chimney on frigid nights the dead of winter often need to be driven out at start-up with additional air on the make-up side, i.e., crack a door or window. 3) Stacking the entire first round of burn, i.e., kindling, medium-sized pieces, and full size logs, captures the full BTU load, driving it into the fuel, producing superior burn results. 4) The first round of burn usually needs to be knocked down into a good coal bed and re-fed with full size fuel in moderation after that. 6) The enemies of a clean burn are inadequate make-up air, turbulence at the floor, and lack of fuel. 7) I have make-up air at the floor as required by NY State code, and supplemental air from over the firebox as recommended by Rumford. Make-up air needs to draw evenly and in proportion to the burn; overly-accelerated velocity causes smoking. So far; so good. I reconfigured my intake air so that I now have two 6" diameter intakes - one up; one down..
Three kindling loads with a progressively larger-as-it-goes-outward stack are afire in the e-House Rumford. After 10 to 15 minutes or so the fire is at 1000 degrees in the firebox, this using birch, pine, maple, and ash. Blue flames. With 200 CFM (minimum) outside air being delivered into the firebox - half from the bottom and half from the top - there are no discernable drafts, no smoke, no odor, and the "crack the door" protocol was not used for this test. The fire is quite as a mouse and reflecting heat back into the room nicely. The outside temperature is 37F; wind speed is 19 MPH w/ 37 MPH gusts. Atmospheric pressure is low. It is snowing on and off. I think we have it beat. The trick is: lots of fuel, lots (your 200 CFM+) of PASSIVE air that is drawn at its own chimney-bleed replacement rate. We are not just good, but great. And speaking of "grate" - I am going to fool around with a design for the Rumford teepee stack..